February 28, 2019, 9:03 a.m. The newspaper is traditionally the only form of entertainment available on the toilet, but times have changed. 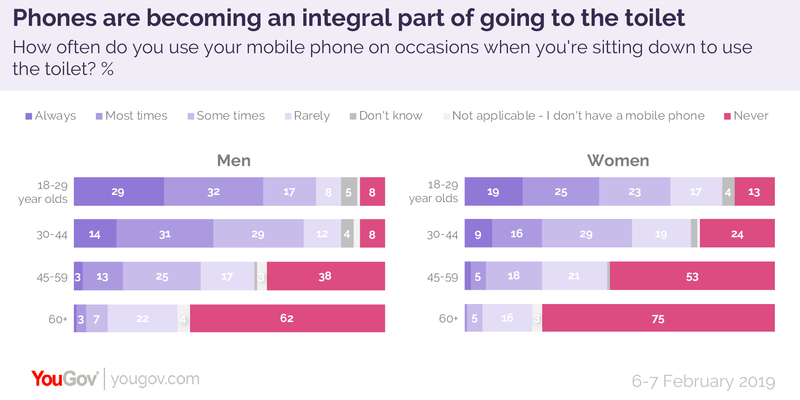 A new YouGov Realtime survey reveals that a trip to the toilet is increasingly not complete without a phone. The majority of Brits (57%) admit to using their phone on the toilet, including 8% who say they “always” do it and another 14% who say they do “most times”. Among the youngest Britons, however, that figure is much higher. A majority of 18 to 29 year old men (61%) say they use their phone on the throne every time, or most times, as do 44% of women of the same age. Overall, 86% of men and 84% of women under 30 say they do it to some extent. This figure declines with each subsequent age group, bottoming out at just 33% of men aged over 60 and 22% of women the same age saying they ever use their phone while sitting on the loo. Gender also plays a role: across all generations men consult their phones more frequently than women. This demographic shift means that phone use on the toilet can only become more commonplace over time. This will dismay health experts, who would rather we left our phones alone while in the loo. Germs are present all over the bathroom and touching a wall or a toilet before sitting down will transfer them to your phone if you subsequently decide to do some browsing on the bog. And because we wash our hands but not our phone after using the toilet, this means that we are taking those germs away with us when we leave, only to slather them all over our hands again the next time we use our phones.